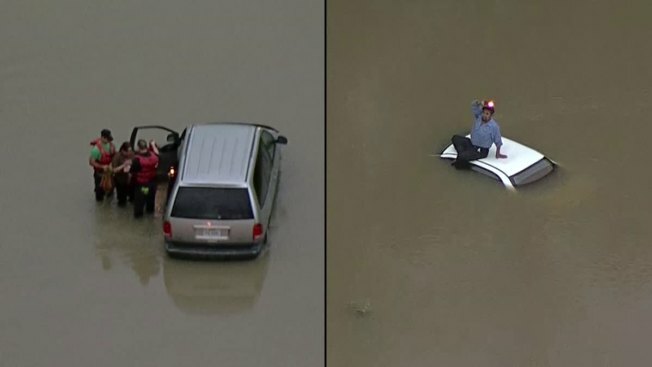 A man became trapped after he drove into high water in Dallas in an effort to help a woman who was also stranded Wednesday morning. The man's boss, Craig Chapman, said the driver was on his way to work when he saw the woman, whose van was stuck in knee-deep water near the intersection of California Crossing Road and Wildwood Drive. His vehicle became trapped when he drove over to help. Authorities arrived at the scene just before 6:30 a.m. and helped the woman walk to safety. The woman was treated at the scene and released. Responders then helped the man, who was sitting on his nearly submerged vehicle. Paramedics evaluated him at the scene and released him. Chapman said the man, who does not speak English, called asking for help. Chapman and others at Complete Landsculpture saw him on live footage from Chopper 5. "We were looking at him on the TV, trying to figure out where he was so we could get to him," Chapman said. "We kind of figured out where he was, pinpointed him and came to see what we could do to help him out." The woman, who also doesn't speak English, declined an interview request. Drone video shot over the Memorial Day weekend shows the devastation in parts of Texas ravaged by floodwaters. This video from The Woodlands shows rivers overflowing their banks and streets washed out by water. Flood waters have claimed at least six lives across the state. Local authorities acknowledge the area may not have seen the worst of the flooding just yet. There could be more rain on the way by later this week. Texas has been inundated over the past several days, with heavy rain bringing the Brazos River to record levels on Tuesday. Nine weather-related deaths have been reported. The area near California Crossing Road and Wildwood Drive is known to flood along Elm Fork of the Trinity River and nearby Daniel's Creek. North Texas remains under a flash flood watch through Thursday. NBC 5's Chris Van Horne contributed to this report.